Kind of a random title, no? It is, however, a handful of the myriad of things on my mind today. Ragnar is SO CLOSE now. In less than two weeks I will be back at home, basking in the glory that was 196 miles of relay deliciousness. Did I mention yet that I have the shortest leg out of all 12 runners on my team? Only by .01 of a mile, but still. As someone who was brought in to the team very late in the game after another member dropped out, I am so eternally grateful that I wasn't stuck with the 17, 18 or more mile distances. Mine is 13.6. Easy peasy (ha!). My packing list is, uh, filling up. Our team had a conference call last week and I think one of my team mates summed it up nicely when he said that we should remember all of the items we had discussed, but to still pack lightly. Ummm . . . . wha?! I have bought a few new goodies just in time for Ragnar, such as The Stick (such an ominous name, no? ), another pair of cw-x Stabilyx capris and a second pair of my current favorite running shoes, the Saucony Progrid Ride 5s. Have you ever used The Stick before? I am not 100% sold yet. As a side note, I have never, ever had blisters from running until the Seattle Rock-n-Roll, which I ran in the same shoes I trained for the race in (up to 11+ miles at a time). Nothing major, but still annoying. On my 8 mile run today the blisters started coming back. What gives?! Could this be a sign my shoes are wearing out? You remember all those hundreds of times I whined and complained about how injured I have been? I don't want to jinx anything, but I am feeling so much better lately. Not sure exactly what is causing the shift, as I am doing a whole bunch of things every day to help heal, but it seems to be working. I have recently started doing dynamic stretching before each run, in addition to my bridges, nerve gliding and pelvic correction exercises, and I have started stretching after each run. My naturopath also put me on a supplement that may or may not be helping with repairing damaged muscle tissue, as well. I am still doing the same program of the least amount of running possible and lots and lots of strength and cross-training, as well. I am not going to get my hopes up, but I feel like this is very good news right now. On my run on Sunday, the longest since RnR, I had very mild knee discomfort (I hate using the "P" word) after stopping for a few minutes and then resuming the run. It went away quickly, as well. Post-run, I had very little soreness in my IT band and hamstring. People, this is HUGE progress for me. Recently I was looking at this lame, sorry mess of a medal display, and thinking how sad my Ragnar medal/bottle opener is going to feel joining this fray. 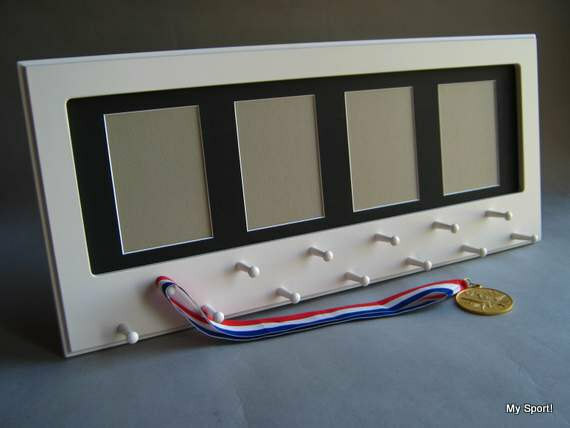 I think I need a proper medal holder. I was thinking this one below might be pretty cool, what do you think? I kind of love that it would give me a place to display some of my favorite race photos, too. I also like metal ones, like this. So many choices! 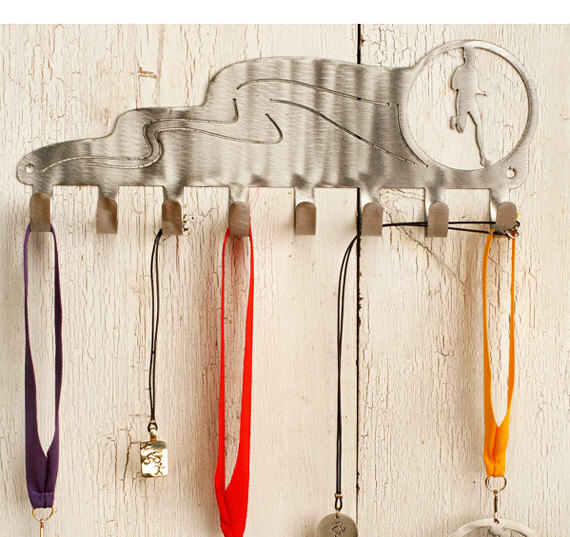 Do you have a race medal holder that you love? Have you ever tried The Stick? I have a medal holder from https://www.medalhangers.com/ I went with them as they are a local company in Redmond. I was able to organize a local pick up and saved on shipping. Oooo, I love so many of the ones on that site! Thanks for sharing. How cool would it be if the cityscape one was of Seattle, with a Space Needle on it?! Hmmm . . . . I'm SO glad your running is getting better. I was injured in 2010 and still have many paranoid moments where I think I've re-injured myself. Coolest discovery from Ragnar last year was the GroupMe phone app. It allows group texting without having to have all of your teammates phone numbers pre-programmed into your phone. Allowed for great team and Van1/Van2 communication. Thanks for the tips! I will mention to my group about that app. My phone stinks at group texting, so something like this would help! The post about your medal display is great. 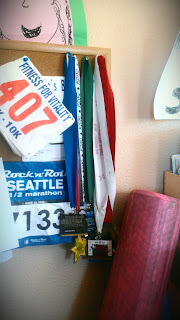 I hadn't thought about displaying my bibs on something proper, as well. That etsy shop is great because you can make your own text. It might be hard to come up with something perfect, though! Yeah for Ragnar! What is your start time and team name?! Team Six Pack With Racks is starting at 9:30!